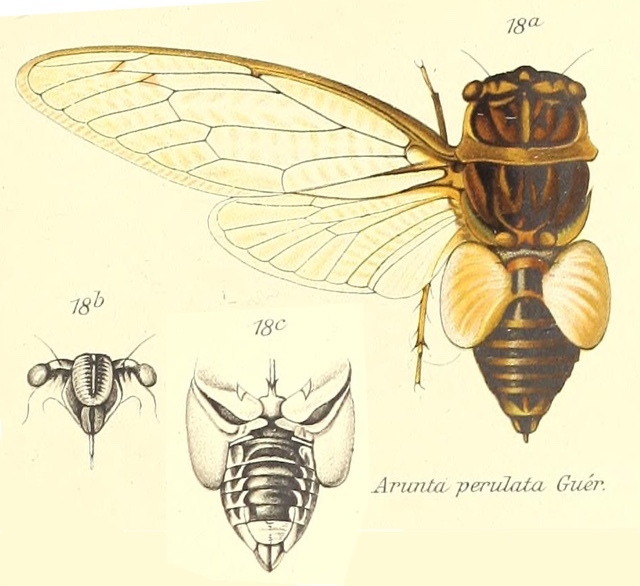 Arunta perulata (Guérin-Méneville, 1831). Found in Australia. Known as a White Drummer. Like other members of the tribe Thophini, like Thopha colorata (Orange Drummer) and Thopha saccata (Double Drummer), they have massive sac-like tymbal covers, which is why they’re called drummers. Characters. — Head transverse, moderately truncate in front of eyes, between eyes much narrower than base of mesonotum ; rostrum reaching the posterior coxae; pronotum moderate broad, its breadth considerably less than length of both pro- and mesonotum (including the basal cruciform elevation); tympana very largely developed and sac-like, their apices obliquely extending beyond the lateral margins of the abdomen and to about half its length; opercula very small, not extending to base of metasternum, placed wide apart, and with their apical margins convex; anterior femora incrassated and spined ; posterior tibiae with a few lateral fine spines; tegmina and wings talc-like, tegmina with eight apical areas.